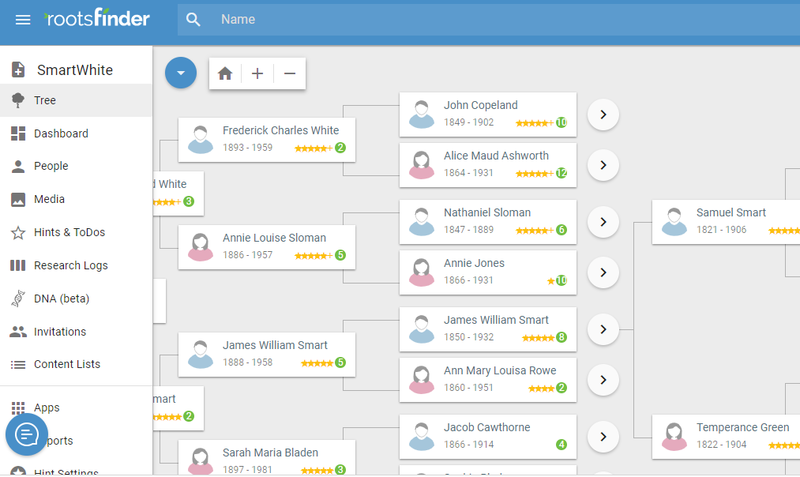 You can build a tree like this from scratch, upload from FamilySearch or import a GEDCOM from an existing tree. Scratch: Building from scratch means you enter all the information. Many people start doing family history this way by entering what they know about close relatives. FamilySearch Upload: If you have a tree at FamilySearch, you can upload it directly. It will come over will all the images and sources. Many people find lots of heritage photos distant cousins have added to FamilySearch that they didn't even know were there. Note: FamilySearch has many duplicates. You'll get those, too. GEDCOM Import: If you import a GEDCOM, it will bring over the citations of your existing references. GEDCOMs do not bring over photos or document images. After logging in, you open to the landing page. The Demo Theater on the right has a huge library of tutorial videos. You might want to watch few before building your tree. To start your tree click on the "+ New Tree" on the left side. Fill in all the blanks on the next screen. You cannot leave any of the fields blank. Choose whether your tree will be public or private. 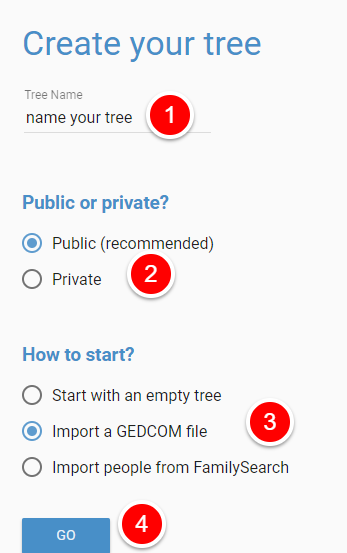 Click on Start with an empty tree (if you wish to manually enter the information), Import a GEDCOM or Import people from Family Search. The "GO" button will turn blue when you have completed 1-3. Click on the blue Go button.